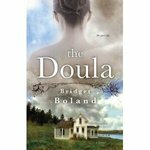 Bridget Boland’s debut novel, The Doula, is now available for pre-order from Amazon. It will be released September 4 from Gallery Books, a division of Simon & Schuster. Boland is the guest judge of this year’s Raymond Carver Short Story Contest. We specifically asked her to guest judge because she is a debut novelist, and we like to highlight the importance of recognizing first-time authors and their contributions to the literary landscape.